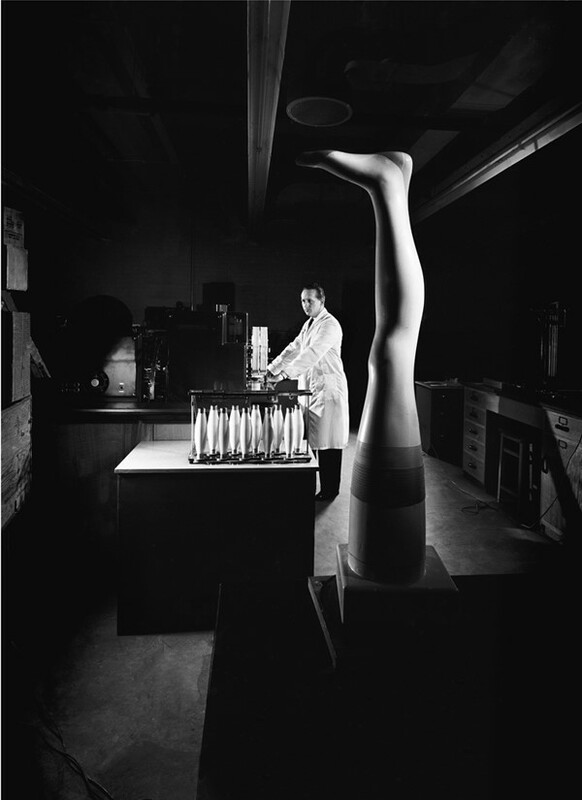 The late Maurice Broomfield’s photographs of postwar industry look more like the work of avant-garde modernist Man Ray than depictions of dirty, noisy workplaces. Born in Draycott, Derbyshire in 1916, Maurice Broomfield left school at 15 to work as a lathe operator on the Rolls Royce assembly line. His evenings were spent at Derby Art College where he would discover the talents that that would lead to his narrow escape from life on the factory floor. Returning from a photographic trip around Europe after the war, a lucky introduction led to an invitation from ICI for Broomfield to take photographs of their factory and its workers. The starkly lit, black and white portraits quickly caught the attention of other industry leaders and he was soon taking commissions from equally prestigious corporations for their annual reports, exhibitions and trade fairs. Inspired by the drama of industry and moved by the skilled and noble nature of the factory operatives, Broomfield transformed otherwise mundane, everyday scenarios into theatrical and often otherworldly homages to Britain’s factory workers and emergent technology. Between 1954 and 1960 he was publishing a photograph a week in the Financial Times and regularly curating and exhibiting at the Royal Photographic Society. Despite success, Broomfield admitted to a sense of unease about the alternative reality belied by his varnished compositions; a life that was often dangerous and mind-numbingly boring, a life he very nearly had. He maintained, however, that any lesser presentation of the workers would have been a great disservice to them. Maurice Broomfield – Industrial Photographer and In the Best Light, a collection by local photographers, runs at The Public until 26 June.